Via here and here and here. 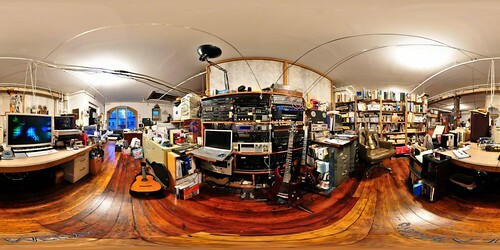 The composer Laurie Spiegel in her studio. An amateur musician from childhood, Spiegel detoured through the social sciences at university and then returned to music, later founding NYU’s Computer Music Studio. She worked at the renowned Bell Labs in the 1970s writing notational software and late wrote software for personal computers used widely in rock and pop music circles. The geodesic dome redux. The Pavilion is a public art project by Vancouver artist Holly Ward on the grounds of Langara College in Vancouver. The dome is only up for another month, in case you’d like to go see it. Click link for events in the space. 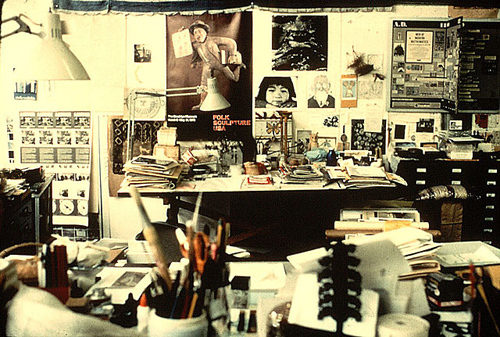 There’s something compelling about Ray Eames’ desk area, papered with work and photographs. 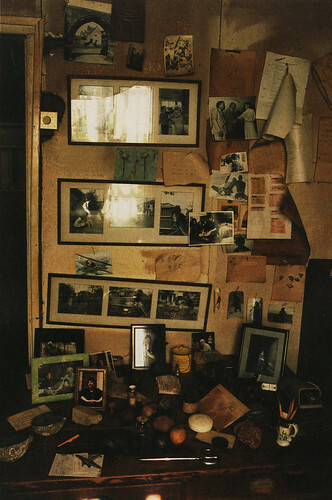 Many people seem to have a fierce aversion to clutter these days (driven no doubt by the storage furniture industry) but artists like to have materials and visual stimulation at hand in their studios and there’s some evidence that this supports the creative process.